Parents take a bow! — A.B.L.E. To kick off our new semester, our teaching artists and facilitators hosted a special class for the Parents of our actors! 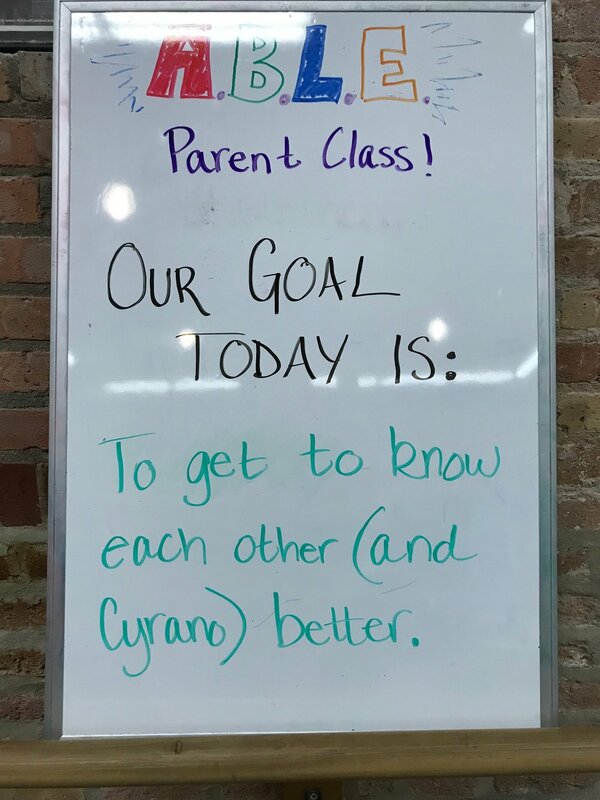 We often don't have much interaction other than the hectic drop-off and pick-up times, so parent class provides an important chance to strengthen our community. Program parents get to experience a class from start to finish. This helps them develop a vocabulary to speak with their actors at home and to reinforce the work we’re doing in rehearsals. They also get to see our talented team in action and appreciate the work, energy, and heart that goes in to each rehearsal. 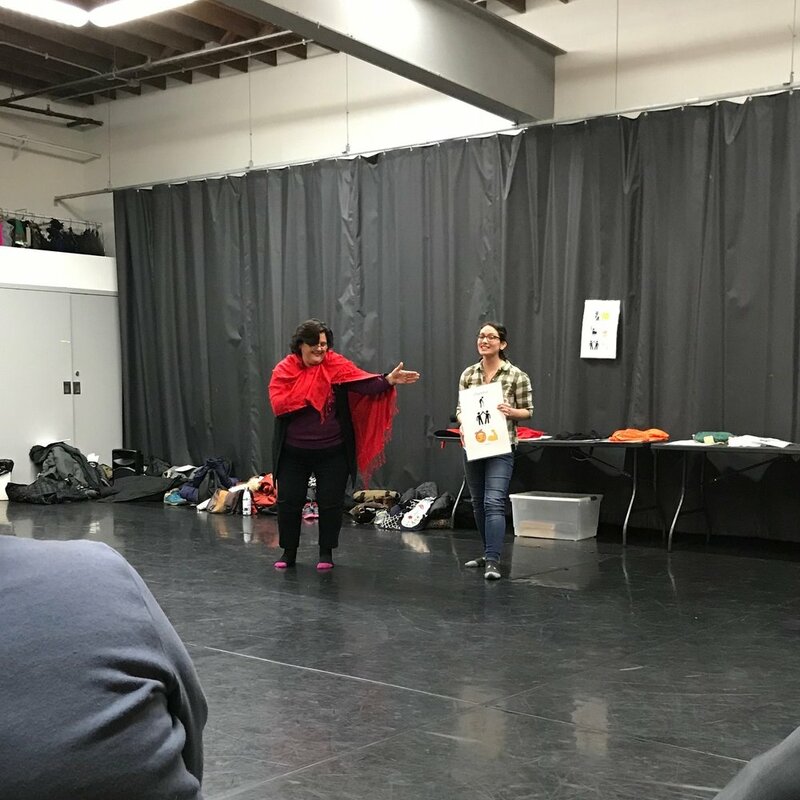 For our staff and volunteers, it’s a chance to have a “dry run” of classes, to start working with our class visual aids and props, and practice the language and structure we want to use in sessions. This is particularly valuable for our new facilitators so they can learn the ropes before all of our actors come in. Kaylie started us off by DJ-ing dance party. For the first few songs, we enjoyed moving around and also introducing ourselves to new faces in the room. For the last song, we played "Freeze" when the music paused, and also took turns teaching the group new dance moves. From there, Katie led everyone in a standard ABLE warm up focused on breathing, movement, and sound. We also emphasized our articulators and practiced this with the tongue twister "The Tip of the Tongue, the Teeth, the Lips". Sharon, Ben's mom, mentioned that she really liked focusing on breath and that it is helpful for relaxation and feeling grounded. After going through the schedule, and nominating Lucy's mom, Jo Dee, as our schedule keeper, Sean led us in check in. Check in is a chance for us to all get to speak as ourselves, to learn more about each other, and to practice our listening and sharing skills. We had a slightly longer check in than usual today because it was important to get to know each other well! We recalled lots of exciting ABLE moments, with many people pointing out the growth that you can see in our actors from one show to the next. Every class includes an ensemble game. The game varies from week to week, but the focus is always to work on teamwork, listening, and practicing our basic skills. Today we played a favorite called On the Spot. This involves us making tableaux (a frozen stage picture) of different locations. We created a theatre and a bakery (the settings for Acts 1 and 2 of Cyrano). Together, we made lots of interesting pieces, we had a curtain, a spotlight, a program, speakers, and seats in the theater. And an oven, rolling pin, and lots of baked goods in the bakery! The best part was when we made our tableaux come to life! We then circled up to go over some details about the semester including a first look at the set model for our production, a review of the calendar, and a basic overview of the plot of Cyrano de Bergerac. This story is new to a lot of people, so we spent some time introducing the basic characters. We looked at our character posters and costume pieces and took turns going up to embody different people. 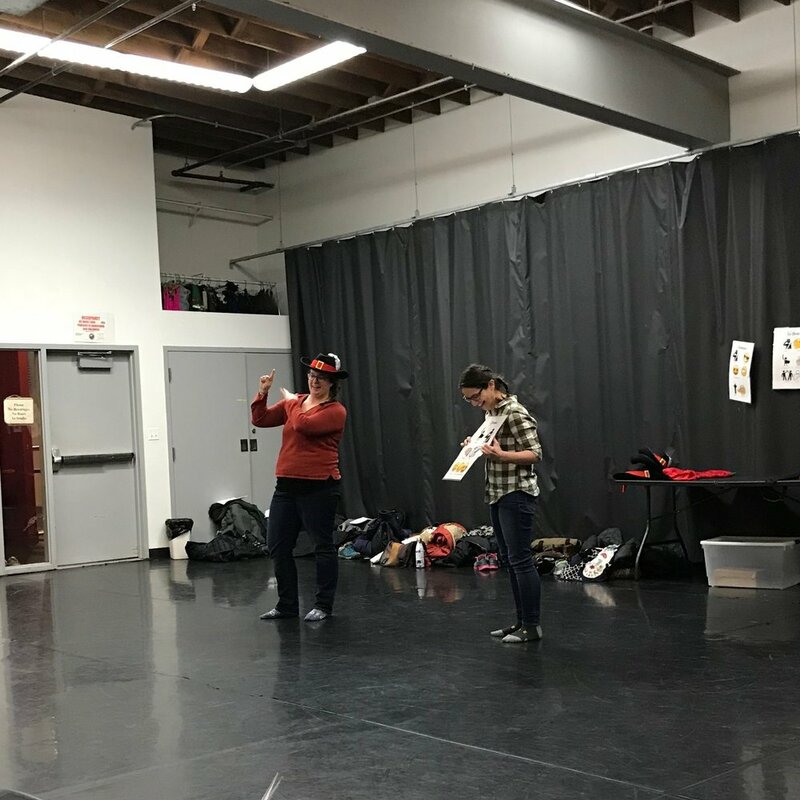 ABLE uses dropping in as a tool to ensure all of our actors, regardless of verbal communication skills and short term memory, are able to perform. It requires a lot of skills from both our actors and facilitators. In the parent class, we like to have our parents try their hands at both dropping in and being dropped in to experience this technique firsthand. 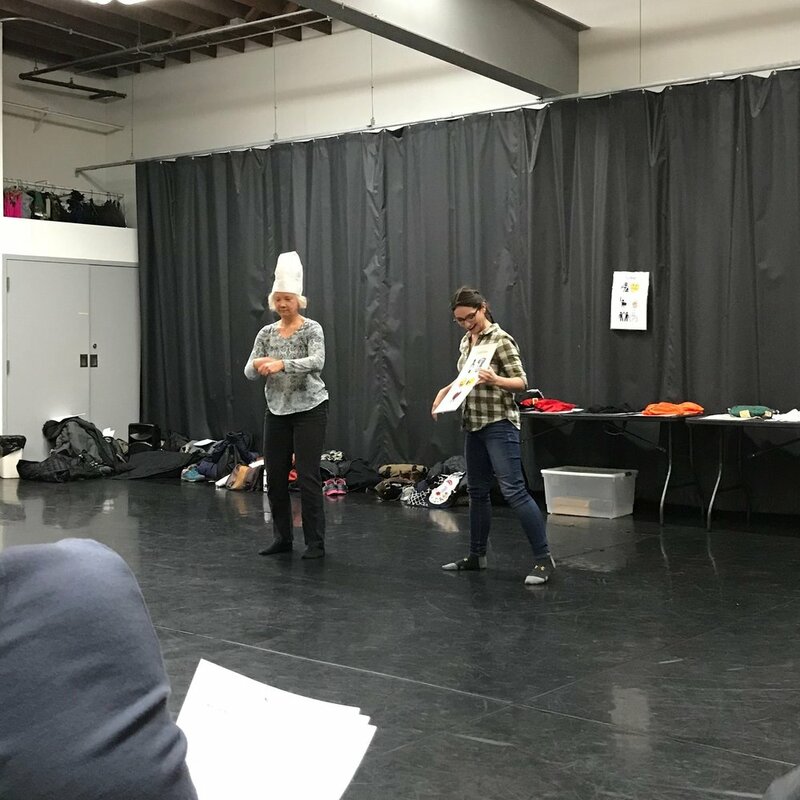 For this class, we did “Text Layups” – we made two lines, one line of actors and one line of dropper-inners, one person from each line ran into the center of the room, pulled a line out of a hat and performed. The character and scene were a total surprise, so we had to be ready for anything! After this productive conversation, we came together for check-out. We share our roses (favorite part of class) and thorns (least favorite part of class). There weren't many thorns to go around, but many people noted that check-in was their favorite part of the class, and they enjoyed hearing each other’s favorite ABLE stories. Lucy's mom really liked being schedule keeper because it made her feel like she had some control and knew what was going on (exactly why we do it with our actors! ), and some of our facilitators remarked that it's fun to see the similarities between parents and children. Alena finished us off by showing everyone how to lead our call-and-response closing, "I Take from the Heavens" and then we were off from there. We hope to continue building our parent classes each semester and finding ways to connect with each other to support our actors! Next up: our ensemble hits the rehearsal studio starting on Friday February 23rd. We'll be jumping right in with characters and personality traits...stay tuned!